Does research into medieval history serve any useful purpose other than the pursuit of scholarship for its own sake? Labour Education Minister Charles Clarke thought not when in 2003 he declared that the primary purpose of the university system was ‘to enable the British economy to deal with the challenges posed by the increasingly rapid processes of global change’. From this numbers of senior university managers have taken their cue, not least my own vice-chancellor, Professor Patrick Johnston of the Queen’s University of Belfast, who in May of this year opined that what society needs are ‘citizens that have the potential for leadership’ not ‘a 21-year-old graduate in sixth-century history’. Two months later graduating history students understandably refused to shake his hand. The subject, notwithstanding, is thriving and has rarely been more relevant, with major breakthroughs coming from some unexpected quarters. 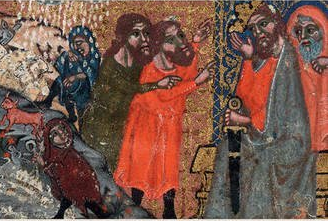 Science-shy historians rarely regard biologists and geneticists as their natural allies, nevertheless, investigation of the precise strains and provenance of the Yersinia pestis genomes respectively responsible for the Justinianic Plague of the 540s and Black Death of the 1340s has yielded particularly impressive results. After long and self-defeating debate historians now have forensically accurate diagnoses of these deadly Old World pandemics and know that they were the product of separate crossovers of this dangerous zoonotic from rodents to humans. Next on the biologists’ agenda is reconstruction of the diffusion paths by which the infection reached Europe and Africa from its primary reservoirs of infection in the semi-arid interior of Asia. This is costly, high-precision, team-based research of the type likely to win the approval of the most managerial vice chancellors. It relies upon identifying the signature DNA of Y. pestis in the dental pulp of teeth retrieved from datable plague burials and then matching the results against the bacterium’s recently reconstructed genetic profile. Those undertaking this work and their funders see real merit in unmasking the identities of centuries-old mass killers and elucidating the evolution and impact of a deadly pathogen still active in the world today and mostly kept in check by improved hygiene, accurate medical diagnosis and prompt treatment with antibiotics whose long-term effectiveness cannot be guaranteed. They take as axiomatic that plague’s three great human pandemics, in the sixth, fourteenth and nineteenth centuries, offer lessons that modern society can ill-afford to ignore. Climate scientists likewise make no apology for privileging the medieval centuries as they investigate the back history of current global climate change. They are interested in the centuries-long episode of elevated global temperatures known as the Medieval Climate Anomaly and which around 1000 CE constituted the last period of significant northern hemisphere warmth prior to the present. Their increasingly sophisticated climate reconstructions reveal that over the course of this era small changes in global temperatures drove big changes in atmospheric circulation patterns by altering pressure gradients and thereby changing the force and direction of prevailing winds with profound consequences, for example, for the distribution of precipitation over Europe, the severity of drought in central Asia, and the strength and reliability of the South Asian monsoon. Further, commencing in the late thirteenth century, the transition from the circulation patterns of the Medieval Climate Anomaly to those of the opening phase of the Little Ice Age brought a heightened incidence of extreme weather events and concomitant ecological stress almost everywhere and provided the context for the recurrent famines, floods and droughts that devastated both Western Europe and China at that time. Ominously, in central Asia these were the circumstances under which plague was reactivated from its long dormant enzootic state. Right across Eurasia, in fact, rapid processes of global environmental change were challenging vulnerable human societies (Charles Clarke take note!). Those seeking an instructive analogue for the potential consequences of climate change in our own time need look no further. For Europe, in the grip of a deepening commercial recession, the timing of these environmental developments could not have been worse. These economic difficulties sprang from escalating warfare in the Middle East and elsewhere, the drying up of European silver output, deteriorating terms of international trade, credit default and banking failure, soaring defence and security costs, mounting hostility between Christians and Muslims and much else. The upshot was that the interlinked world system of commerce that had come into being over the course of the thirteenth century, by which the silks, spices and ceramics of the East were exchanged for the bullion of the West, was under threat. Arrival of the Black Death in 1346/7 was the final and most toxic ingredient in this cocktail of woes, which, as they worked themselves out over the next century and a half, realigned the pan-Eurasian economic order to the relative advantage of Europe and its Atlantic-edge economies in particular. Fourteenth-century Europeans were divided among themselves into many competing and often warring principalities and kingdoms. Numbers of the problems that beset them — of sustaining growth, accessing markets, defending frontiers, succoring the poor and coping with climate change — are those that preoccupy us today as the United Kingdom prepares to leave the European Union. For us, like them, it is hard to have confidence in a future with the omnipresent risk that at the level of individual nation states we may be overtaken by events far outside our control. My new book, The Great Transition: Climate, Disease and Society in the Late-Medieval World, takes stock of these developments, integrates the exciting new findings of biologists and climatologists with those of historians, and examines how the English economy in particular weathered the perfect storm generated by this temporal conjuncture of destabilising natural and human forces. The book originated as a set of lectures. Audiences responded with enthusiasm and no one objected that the events and developments described occurred too long ago to be of interest or relevance today. On the contrary, the resonance of the past with the present is palpable.